Thomas Muller missed a penalty following Simunek's dismissal, but Bochum survived only until the hour mark before Thiago Alcantara doubled Bayern's advantage. Lewandowski completed the win with the last kick of the game, keeping Bayern on course for a treble this season. 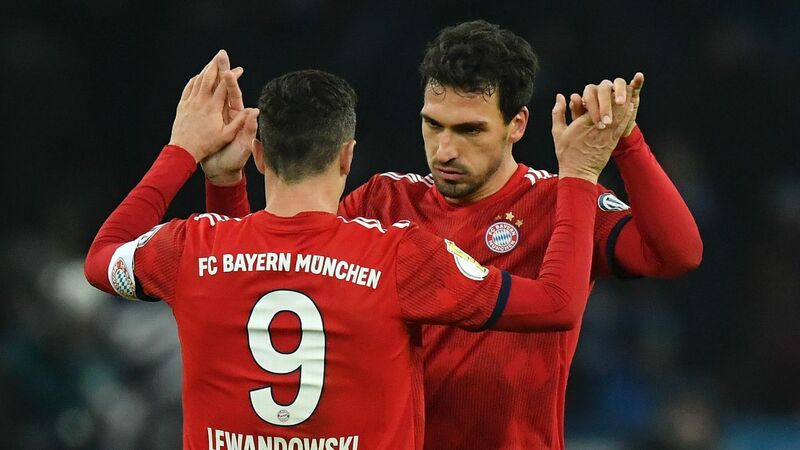 It's the seventh straight season the Bavarian club has reached the semifinals of this competition. The other semifinal will be between Borussia Dortmund and Hertha Berlin, who found it a little more difficult against 2.Bundesliga side Heidenheim. Two goals from Vedad Ibisevic cancelled out Arne Feick's opener, before Genki Haraguchi gave Pal Dardai's men a two-goal cushion. Marc Schnatterer gave Heidenheim some hope with a penalty eight minutes from time, but Hertha held on to reach the last four for the first time in 36 years, keeping their hopes alive of reaching the final in their own Olympiastadion. That is where they will host Dortmund in the semifinal in April, while Bayern will have home advantage against Werder.